The penultimate race of the Clipper 2017-18 Race had it all – the final ocean crossing and some slick and fast racing. The fleet was so quick that the winners arrived a day early into Derry-Londonderry. Visit Seattle was the first in, making its claim for the overall Clipper Race trophy. Visit Seattle was given a hero’s welcome in Derry-Londonderry, with people lining the banks of the Foyle from Greencastle to the city centre after the team crossed the finish line in an area north east of the entrance to Lough Foyle, Northern Ireland, at 00:21:57 UTC on Monday 9 July, after the team completed the Atlantic Ocean crossing in just over 12 days. Unicef’s decision to play its Joker Card for Race 12 certainly proved to be a good one, with the team taking second place, just 45 minutes ahead of the third placed Garmin. Whilst it missed out on a podium, the biggest reception was reserved for the adopted team of Derry-Londonderry, HotelPlanner.com. After almost eleven months and 40,000 nautical miles, Derry-Londonderry born Clipper Race Skipper Conall Morrison and Round the World Crew Member Roseann McGlinchey returned home, with the pair and their HotelPlanner.com teammates cheered on by locals, supporters, family, and friends, who had lined the banks of the Foyle as the 70-foot ocean racing yacht joined the other Clipper Race teams at Derry-Londonderry’s Foyle Port Marina. The fourth consecutive Clipper Race Stopover in Derry-Londonderry was another huge success with record numbers experienced across the ten-day Foyle Maritime Festival. 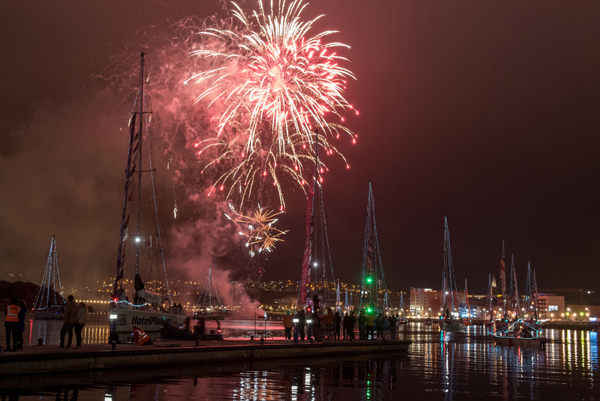 The festival finished in a blaze of colour last Sunday as hundreds lined the River Foyle to bid farewell to the Clipper Race teams as they slipped lines and set sail for Liverpool for the final stage of their global adventure. It was an emotional send off after ten days of celebrations, with the city of Derry-Londonderry delighted to announce that up to 220,000 people are estimated to have enjoyed the packed programme of nautical themed activities during the Foyle Maritime Festival which ran from July 14-22. The Foyle Maritime Festival got off to a record-breaking start with 32,000 people turning out for the opening day. Many of those took advantage of being able to climb on board one of the Clipper 70s in the Open Boat Tours, with 4,212 people going through the public open boats and hearing first-hand what it takes to race across oceans. In conjunction with the council, the Clipper Race also enabled 240 people across the five-day activation window to spend an hour on a Clipper 70 motoring up and down the River Foyle. The festival was also a chance for the Clipper Race crew to let their hair down after almost a year of racing, with crew taking part in cooking demonstrations with Scottish Celebrity Chef Tony Singh and the highly successful Punt Race at Culmore Point. The festival finale event on Friday night included a spectacular Voyages and Parade of Light Showcase, an atmospheric performance featuring aerial performers, an illuminated flotilla of boats in which the Clipper Race fleet led the way on the River Foyle with fireworks and animation, retelling the epic voyage of Mannanan Mac Lir. The Mayor of Derry City and Strabane District Council, Councillor John Boyle, led the city in waving off the fleet and said the stopover had been a major success for the city and district and wider North West region. He said: “It was a sad moment as we waved farewell to the Clipper Race fleet after an eventful week of celebration. We have welcomed visitors from all over the world over the past week and it has been fantastic to see Derry and the wider North West region profiled in such a positive way on a global platform. Once again, we’ve demonstrated our ability to stage an international event generating substantial revenue for the local economy and enhancing the region’s profile as an exciting and unique visitor destination. 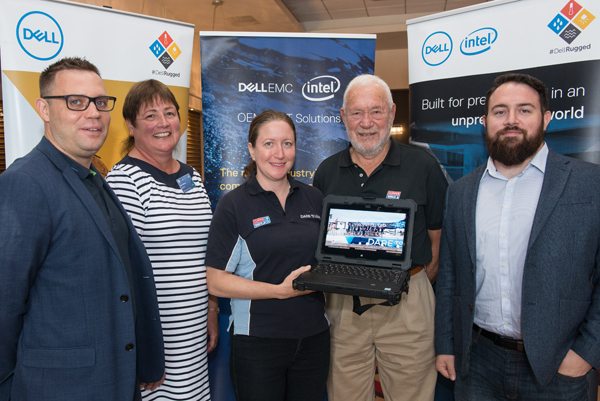 Dell Rugged took the opportunity to hold a customer and partner event during the stopover in Derry-Londonderry where the latest Dell Rugged/OEM, featuring IoT Technology specific to the Marine industry, were showcased to guests from across the EMEA including representatives from Costa Crociere, Safehaven Marine and the UK Ministry of Defence and Royal Navy. rior to reaching Derry-Londonderry the Clipper Race fleet had embarked on a transatlantic crossing from New York where the Dell Rugged products were put through their paces, being used on-board every Clipper 70 yacht to ensure the Clipper Race teams could navigate, communicate, blog and send imagery. Guests had the opportunity to experience what life onboard a Clipper 70 is like when they set sail with skipper Chris Kobusch on-board Qingdao for a sail day experience. Speaking after the event, Dan Eden from Dell EMC said ‘the event was a huge success that I know all the customer and partner guests thoroughly enjoyed and will talk about it for a long time to come. We also achieved our key objectives to grow OEM & Rugged pipeline and win new acquisition customers as well as raise brand awareness of both Dell Rugged and OEM Solutions’. 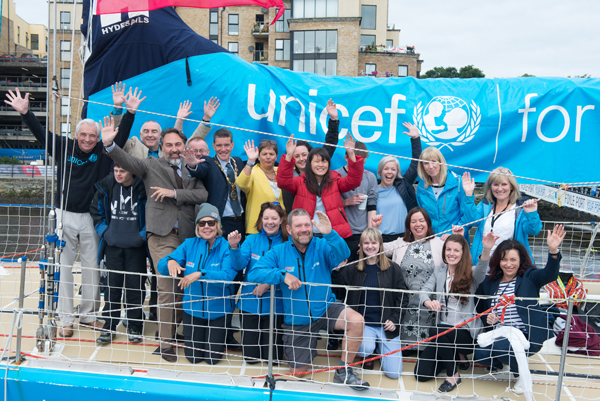 The Derry City and Strabane District Council took advantage of hosting the Clipper Race fleet for the final stopover of the 2017-18 race edition by launching a new partnership with fellow Clipper Race Partner; Unicef UK, announcing themselves as the first ‘Child Friendly Community’ in Northern Ireland. With expert training and guidance from Unicef UK, the ambitious three-year partnership will see local politicians, staff and volunteers from Derry-Londonderry turning to children’s rights to guide decisions that affect children and young people. The partnership was announced on board the Unicef Clipper 70 docked in Derry-Londonderry; providing a unique platform to showcase the Unicef UK brand. The Derry City and Strabane District Council joins four other councils in the UK taking part in the ‘Child Friendly Cities & Communities’ programme, which transforms cities and communities into places where children’s rights are respected and their voices heard. Launched in 1996, Child Friendly Cities is a global Unicef programme that reaches close to 30 million children in 38 countries. In parallel with the launch, Unicef UK and the Derry City and Strabane District Council enabled a number of young people from diverse backgrounds and influencers to experience what life is like on board a Clipper 70, taking four, one-hour long motor experiences out on the River Foyle. 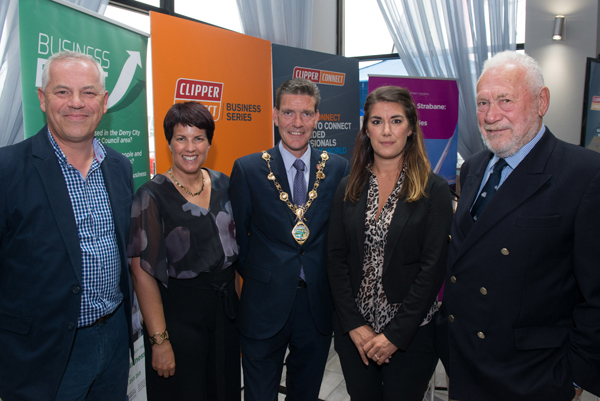 The final event in the Clipper Connect Business Series for the 2017-18 race edition saw the Clipper Race partner with the Derry City and Strabane District Council and the Londonderry Chamber of Commerce for an evening centred around business connections. The purpose of the Clipper Connect Business series was established to act as a catalyst for conversation and collaboration between Race Partners and the different business hubs the Clipper Race engages with throughout the race, with this event being no exception. After providing an insight into the pivotal role the Clipper Race has played on the city since the partnership began in 2011/2012, Jennifer invited the Mayor of Derry City and Strabane District Council Cllr. John Boyle to talk to the guests. Cllr. John Boyle gave a compelling insight into the role he, as Mayor, is doing for the city as well as promoting trade relations and recognising that growing businesses via trading in a global market is one of the most sustainable ways to create employment opportunities. The Mayor of Derry said, “whilst SME businesses make up over 99% of all businesses in our region, many of them rely on the larger organisations and the opportunities presented by them to partner with, and supply to them to make sustainable and growing businesses and economies. We are an outward looking council who have some of the largest employers in Northern Ireland within the District and aim to encourage our companies to explore new markets and opportunities to supply their services, both nationally and internationally. Following the Mayor, John Kelpie, Chief Executive of the Derry City and Strabane District Council, provided an overview of the Mayor’s recent visit to New York in conjunction with the Clipper Race stopover and his trip to Philadelphia where a number of trade missions were secured as part of the international relations framework. Laura Ayres, Head of Partnerships at the Clipper Race concluded the speeches, giving a compelling insight into the Clipper Race as a business platform. Showcasing that the race is a variable platform that works for brands and destinations in very different ways, whether this be down to media, brand awareness, or research and development, Laura also highlighted the trade and investment opportunities for businesses in Derry-Londonderry which are made possible through their Clipper Race partnership. Laura advised the audience that to take on an event like the Clipper Race means you understand that events are not only about the direct economic boost whilst the yachts and crew are in town, it’s the wider opportunity - the one away from home telling people to come here or to invest here. To fit with the theme, local businesses were paramount during the event. The event was hosted at RoCo, a local hairdressing salon/converted event space during the Foyle Maritime Festival and Clipper Race stopover which provided a unique setting overlooking the Clipper Race fleet. In addition, local gin company ‘The Muff Gin company’ provided their twist for the evening with a specialised gin cocktail for the Clipper Race stopover, showcasing the dynamic and forward thinking local businesses that are at the forefront of the city. For the fifth consecutive edition of the Clipper Race, Hyde Sails has been the Official Sail Supplier, showcasing once again the durability, reliability and strength of its products during eleven months of racing in some of mother nature’s harshest climes. In addition to showcasing current products, the Clipper Race provides the perfect platform for new product testing, innovation and development and, whilst the custom sails for the Clipper 70s are highly specific to the conditions and unique challenges that a 40,000nm circumnavigation brings, Hyde Sails have utilised the previous five races for key learnings around strengthening, high-wear areas and construction which have since been translated into other products in its blue water cruising sails. 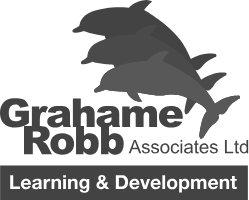 As part of the partnership between the two organisations, Martin Newman, Production Manager - Yacht Sails for Hyde Sails provides industry leading knowledge and expertise to train Clipper Race crew in sail repair, travelling the world and supporting crew during some of the key stopovers. Beyond the research and development opportunities that the Clipper Race provides, the nature of its global circuit also means that Martin works closely with a network of sail lofts all over the world, occasionally having to think outside the box when professional sail lofts are not available. He said: “We visited Sanya, China, for the first time on this race and without access to a sail loft, we had to improvise and use a local street market where a shop had machine strong enough to complete the stitching we needed. In addition to these exciting experiences, the opportunity to work internationally alongside the Clipper Race has allowed Hyde Sails to achieve its additional key objectives of increasing brand awareness and making links with new businesses all over the world. Prior to the fleet departing Liverpool last August, Official Timekeeper Elliot Brown hatched a plan to carry out the most extreme watch test ever devised. The concept was to mount a watch to the bow of one of the Clipper 70s to see how it would cope travelling 40,000Nm, crossing six oceans, being exposed to millions of pressure and thermal shocks, eleven months of constant salt water attack and everything else mother nature (and ocean debris) could throw at it. 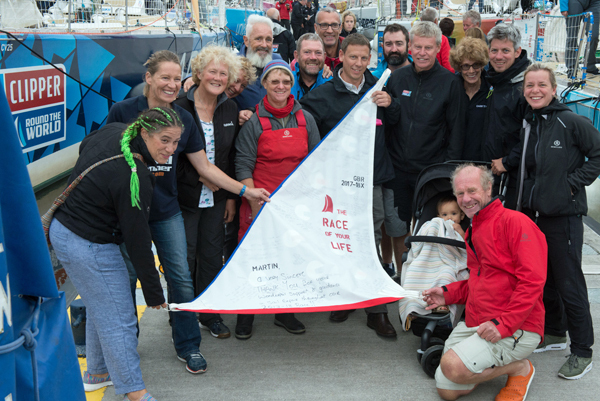 The objective was to then welcome Clipper Race crew and the Elliot Brown watch home after circumnavigating the globe to see if the watch could survive the extreme harsh conditions that it would face, being placed on the bow of a Clipper 70. 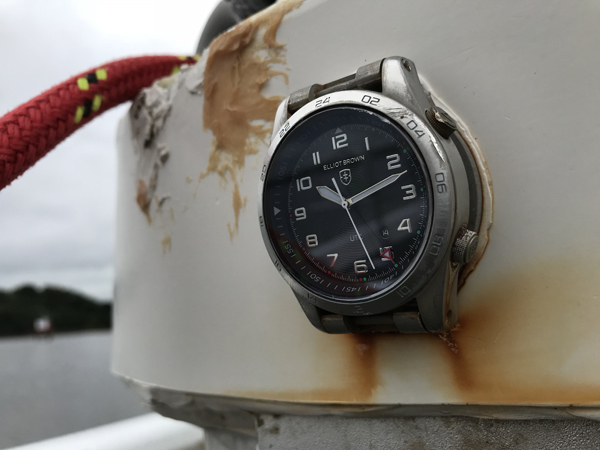 Co-Founder of Elliot Brown, Ian Elliot recently travelled to Derry-Londonderry for the Clipper Race stopover to personally inspect the watch on the bow ahead of the final race of this race edition from Derry-Londonderry to Liverpool. Elliot Brown prides itself on being a durable brand where it’s products are the go to for extreme adventurers, who require a watch that can survive in the harshest of conditions. Elliot Brown’s marketing approach focusses on stories, people and adventure where the watch is part of an incredible achievement. Elliot Brown prides itself on implementing transparent product testing in unique conditions, to showcase its dedication to constantly improve its product range and to identify weaknesses, and this product test has been no exception. Elliot Brown plans to translate the story into retail points of sale via graphics, story boards and video content, showcasing its product’s durability to withstand exceptionally extreme conditions for extended periods of time.